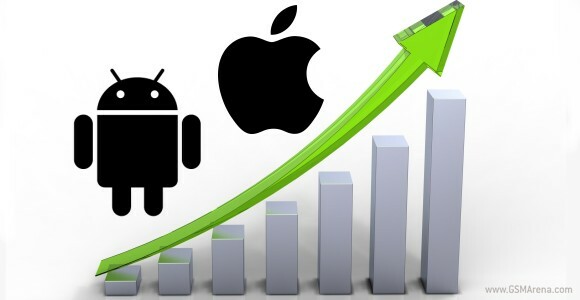 Kantar Worldpanel, a popular research agency has recently put out a report on mobile OS popularity. It covers major Europe, US and Asia markets and crunches usage numbers from September, October and November 2014 and it happens to show a shrinking gap between Android and iOS. According to the data in the US Google's OS had 48.4%, which is a 2.1% drop from the same period a year earlier, while Apple's iOS showed an increase of 4.3%, putting it at 47.4%, just a hair behind Android. The analysis goes on to real that Windows Phone retained its usual third place for the month in question with 3%, compared to 4.7% back in November 2013. In Europe the picture is quite different with Android gathering 66.8% and iOS - 23.8%. Even though the difference is much wider the popularity growth of the Apple is still evident. All of the stats can be vied in the table below. Lol. And I love how just not selling as much as past units but still being the best selling flagship of the year is a "dissapointment"
S4 sold way more than 40. It was in fact S4 and Note 3 that sold so many. And S5 still reached very high numbers surpassing 40 million. Note 4 is still selling well. S3 sold a lot. Note 2 sold well too. Why so hurt?